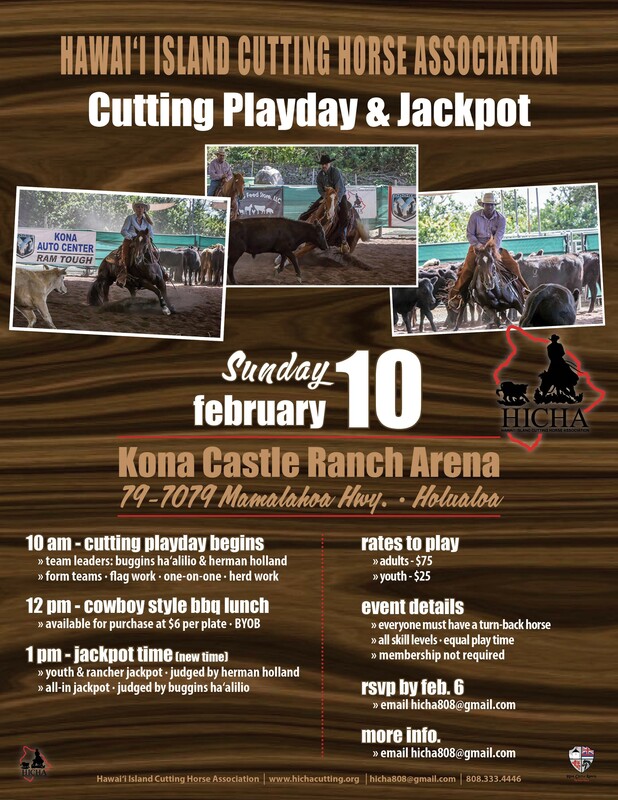 On behalf of the HICHA Board of Directors, I am writing to update everyone on the Cutting Playday and Jackpot scheduled for Sunday, February 10th.The Playday will begin at 10 am, and the Jackpots (Youth/Ranch and All-in) will begin at 1 pm. If you haven’t already done so, please RSVP to hicha808@gmail.com by the end of the day on Feb. 6, so we can order a sufficient amount of fresh cattle. We look forward to seeing folks on Sunday, and having fun! HICHA will hold a member meeting and play day on Feb. 10 @ 10AM. Kona Castle Ranch/KCR Arena. Contact Lilia Kapuniai for details.